The SkyCeiling is a luminous virtual window that can transform interior spaces. 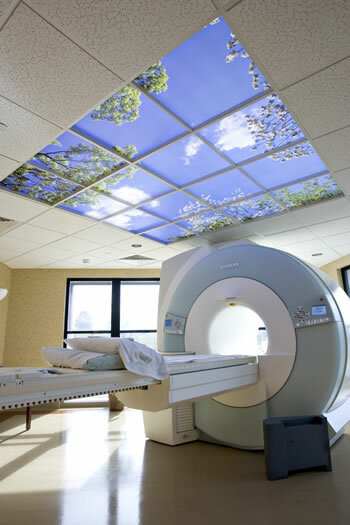 SkyCeilings are particularly appreciated by patients in high tech healthcare settings, like radiology suites; patient stress is significantly reduced. The SkyCeiling is the creation of businessman and artist Bill Witherspoon. While meeting with an orthodontist to talk about treatment for his children and how to pay for it, he thought of painting a sky on the dentist's ceiling. That was the start of The Sky Factory. The high-resolution, large format photography of skies that The Sky Factory makes are the foundation of a SkyCeiling. The secret of SkyCeiling's realism lies in the 6500K daylight-balanced lighting, and the use of an ‘elevator’, their patent-pending aluminum frame that holds the translucent image tile above the ceiling grid. The overall effect is one of clarity and depth. SkyCeilings are so realistic that they produce a genuine relaxation response, just as if one were lying in a field beneath an open sky. Science fiction readers are long familiar with this idea. Most readers have read about the magical ceiling in the dining hall at Hogwarts. However, long before Hogwarts there were the multilevel future cities in science fiction writer Stanislaw Lem's 1961 novel Return from the Stars. How can you brighten up these vast interior spaces? "How do they work it so that the sky is visible at every level of the city?" "Very simple. Television - that is what they called it, long ago. On the ceilings are screens. They transmit what is above the Earth - the sky, the clouds..."
See another cool SkyCeiling designed for a Star Wars fan; find out more about the SkyCeiling at The Sky Factory.